2 WHY IS IT A PROLEM? 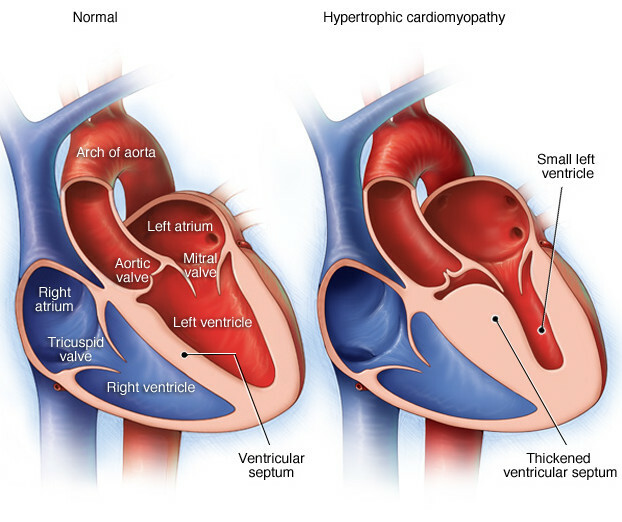 Hypertrophic cardiomyopathy (HOCM): Massive hypertrophy of the left ventricle of the heart (asymmetrical hypertrophy of the ventricular septum). It is usually due to genetic mutations in sarcomere proteins (most common form is autosomal dominant). Commonly this is caused by a ß-myoisn heavy chain mutation. WHY IS IT A PROLEM? This type of hypertrophy will reduce the compliance of the heart, making it more difficult to fill (diastolic dysfunction). A subsequent consequence of this is decreased cardiac output (due to decreased pre-load). Sudden death can occur due to ventricular arrhythmias! 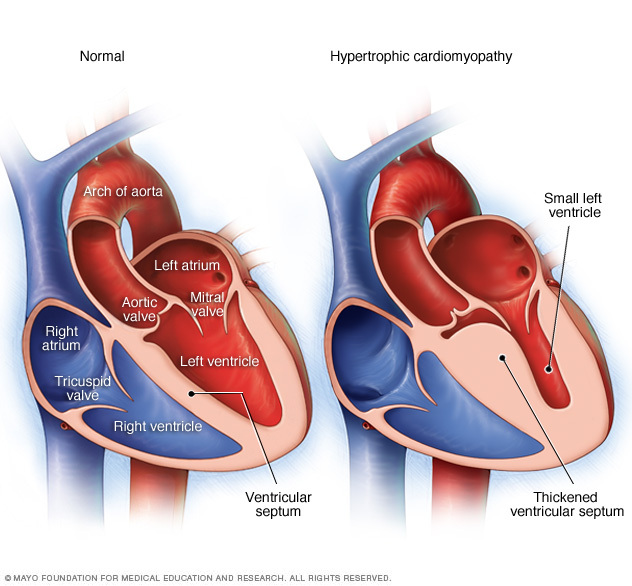 Syncope with exercise: Subaortic hypertrophy of the ventricular septum results in functional aortic stenosis. LV outflow obstruction murmur: a systolic murmur is heard in a classic crescendo-decresendo pattern that is very similar to aortic stenosis. The difference in pathology here is that the actual cause of the murmur in HCOM is the narrowing of outflow not at the aortic valve, but prior to it (between the ventricle and the leaflet of the mitral valve). Looking at the image above we must appreciate that anything that decrease pre-load (and effectively brings the valve and ventricle wall/septum together) will increase the sound of the murmur. The table below shows how these patterns are different than atrial stenosis. 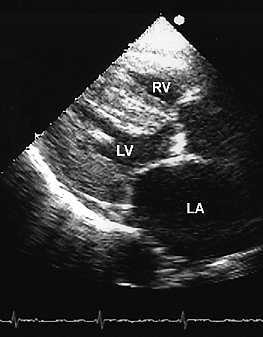 Echocardiography this is an ultrasound of the heart and is very helpful in the evaluation of HCM. The degree of LV hypertrophy can be measured and regions of asymmetrical wall thickness can be readily identified. Biopsy shows myofiber hypertrophy with disarray. Hypertrophy from pressure overload will be organized and look much different than this genetic condition. 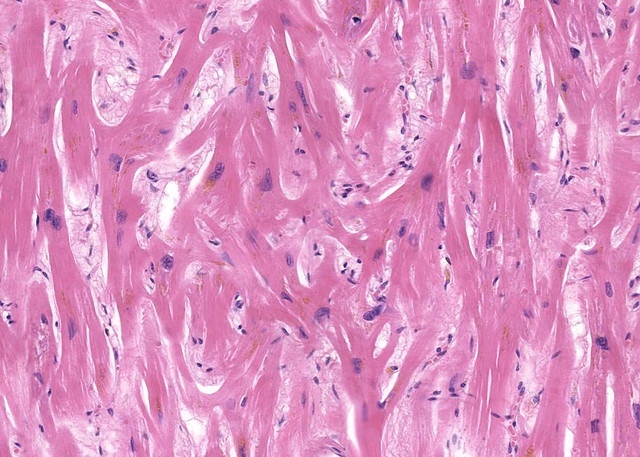 A biopsy of the cardiac tissue below shows a very disorganized arrangement that is a classic presentation for this genetic condition. Genetic testing: this can especially useful if the causal mutation in a family lineage has previously been identified. 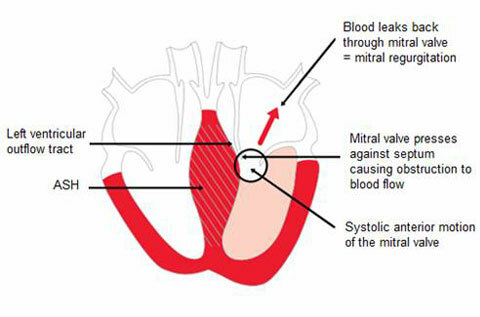 Beta blockers: they (1) reduce myocardial oxygen demand by slowing the heart rate/force of contraction (these will lessen angina and dyspnea); (2) decrease left ventricle outflow gradient during exercise by reducing the force of contraction (this increases chamber size, thus separating the anterior leaflet of the mitral valve from the enlarged septum); (3) increase passive diastolic ventricular filling time given the decreased heart rate. 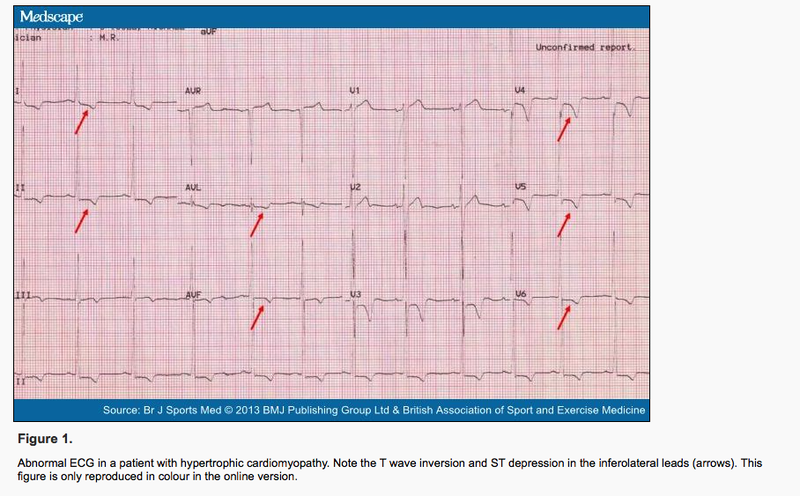 Calcium channel antagonists can reduce ventricular stiffness and are sometimes useful in improving exercise capacity in patients who fail to respond to beta?-blockers. Patients who develop pulmonary congestion may benefit from mild diuretic therapy, but these drugs must be administered cautiously to avoid volume depletion; reduced intravascular volume decreases LV size and could exacerbate outflow tract obstruction. ***Vasodilators (including nitrates) similarly reduce LV size and should be avoided. Different mutations have different phenotypes. For the most part this is a genetic conditions and can not be prevented. Avoiding excessively strenuous exercise is important for patients who have this condition in order to avoid sudden death! Friedreich ataxia: is associated with this condition. This is a neuro-degenritive disease so it is important to keep an eye out for cerebellar ataxia, sensory loss, and muscle weakness when seeing patients with HCOM.